Bijou Lovely: two of a kind. 18 two of a kind. I flew through these two quilts last week, just in time to gift them to two of my friends who are having baby boys very soon. The girls are sisters-in-law and they're both due with their first child within a few days of each other. How fun is that? These little cousins were destined to have matching quilts! 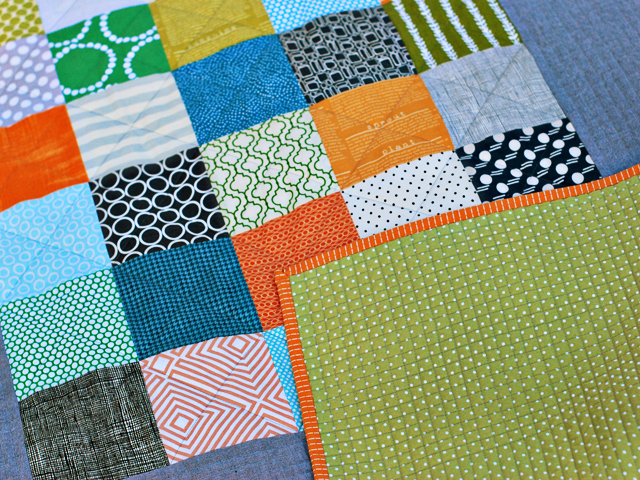 I had planned on just doing simple patchwork, but somehow made my squares way too small! Apparently I forgot to look back at my measurements to see how big I should make the squares before I started cutting. I didn't have much of a few of the fabrics left so I had to figure out another way to bring the quilts up to size. I had seen this quilt by Kelly and must have filed it away in my head, so the idea of an off centered rectangle was the first thing I thought of. This gray Lisette chambray from JoAnn was the perfect fabric to use for the front! I quilted both of the quilts the same, through the diagonal of each patchwork square, and then with intersecting straight lines which created a grid where the lines overlapped. It looked really cool when it was finished, although it was definitely tedious while I was quilting! It's bound in another Running Stitch print from Patty Young's Lush collection. I love the way the orange looks as a frame around all the gray. I had a lot of yardage of this green dot I bought a JoAnn forever ago, so I decided to use it up as the backing of each quilt. Overall I was pretty happy with how these turned out, considering I only had a little over a week to put them together! 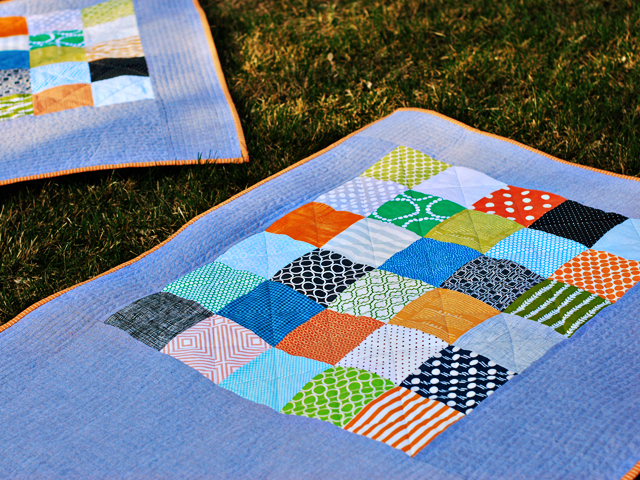 I can't wait to see the two little guys all wrapped up in their matching quilts soon! I absolutely love these, Holly!! Perfect combos, I am sure there will be lots of snuggles under both of them! The quilting on these is super duper stupendous!!!!! Love them! beautiful!! i love the idea of having the blocks off-center! LOVE how these quilts turned out! Fabulous fabric combinations, as always! Those are awesome quilts, what lucky little guys they are! 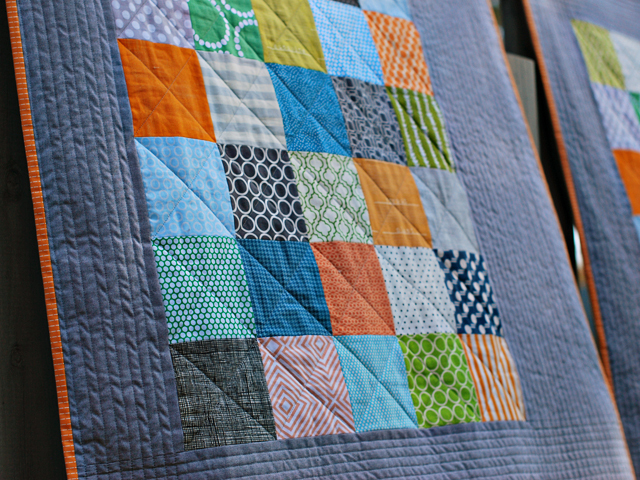 Love the pattern, Love the quilting! Great job! How cute are those!! I love them! fabulous! great job on both! oh! i have been waiting for your quilting reveal after your teaser post. very cute! you are a pro at keeping straight lines! Very cute, and I bet the little boys will love that they have matching quilts (once they're old enough to process that kind of thing - I don't think they'll care when they're newborn!). 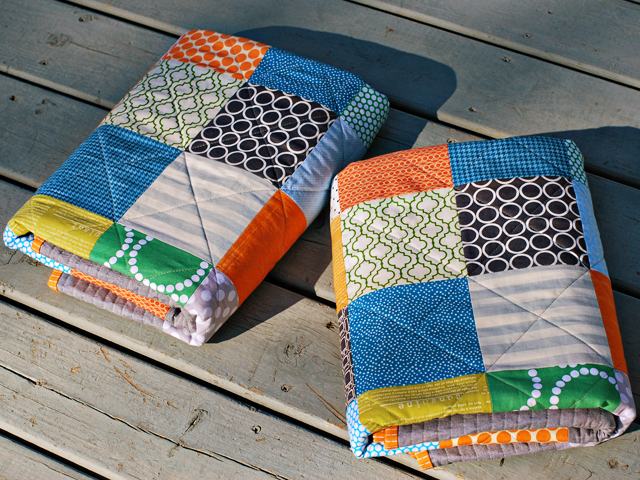 Love these quilts and just the slightest difference so Mama's can tell them apart. 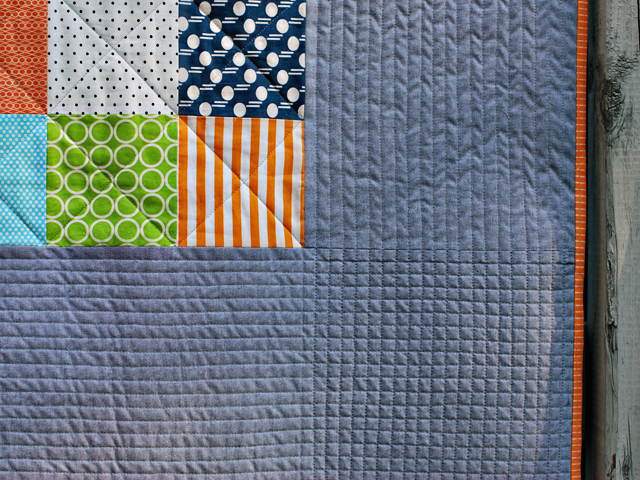 I love the quilting grid in the corner especially a lot! Lucky friends and lucky boys! so cute, and the quilting is amazing! 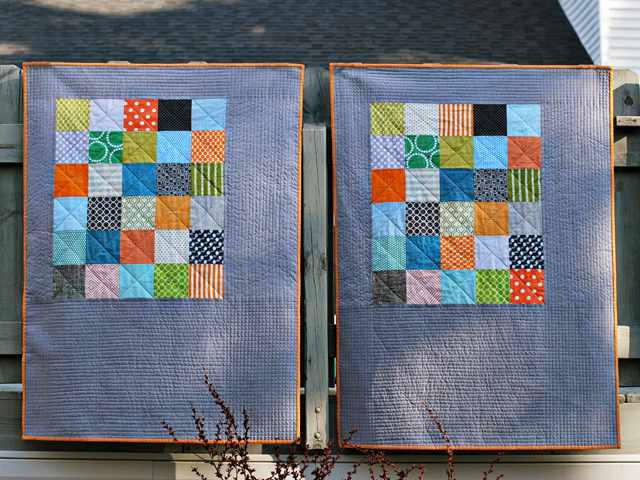 I love that you made them matching, and I really love the quilting! I agree; the orange binding looks awesome with the gray! Great quilts! 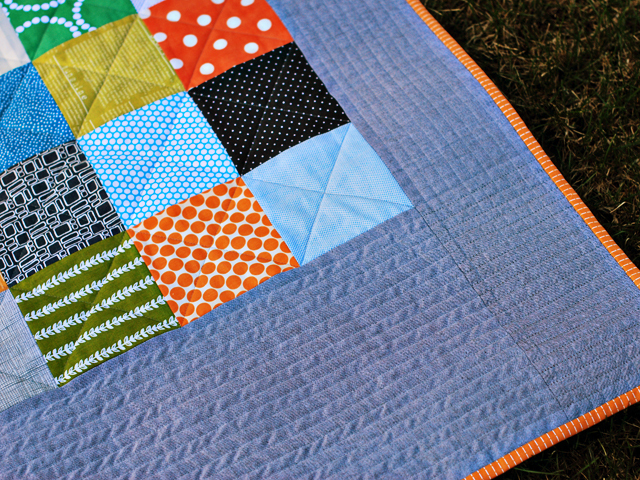 Your straight line quilting is so.... straight!! I love how you intersected the lines in the corners where they overlap. Really nice touch. Holly, these are GREAT! You must work good under pressure. How fun for these cousins to have matching quilts. Love the way you quilted them too.